Dagobert is a very glutton crocodile. Like everyone, he loves candy, lollipops, muffins and all sorts of goodies. 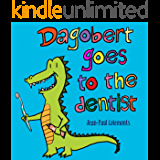 But, one day Dagobert had a terrible toothache. And thatâ€™s when he discovers the importance of taking care of himself and the benefits of a healthy lifestyle.